Over the decades, music has been an important element in the shaping of the identity of Finland’s Swedish-speaking population. Yet this minority has never had a uniform culture and still does not; today, discussion focuses increasingly on the variations of Finland-Swedish culture and its constant state of flux. “Hey, let’s now sing a song that every Finn knows!” As a Swedish-speaking Finn, this casual utterance always fills me with terror. Will I know the song they mean? And will I count as a Finn if I do not? For many of my Finnish-speaking friends, 13 December is just another day. For me, it has always been special: it is St Lucia’s Day, a holiday for singing songs in the Lucia tradition and baking a special kind of pastry known as lussekatter. When I was at school, we would spend months rehearsing the songs, and every year each one of us girls was excited to learn whether she would be picked to play the part of Maid Lucia. Music is commonly recognised to have played a fundamental role in the shaping of Finland’s national identity. The academic study of Finland-Swedish music focuses on the musical traditions in this subgenre and how they have shaped the identity of the Finnish minority who have Swedish as their first language. Here are some examples. The first academic project focusing on Finland-Swedish music was headed by Johannes Brusila, Professor of Musicology at Åbo Akademi University, from 2007 to 2010. Its findings may be found for instance in the anthology Modersmålets sånger [Songs of the mother tongue]. In this book, Brusila himself discusses the notion that Finland-Swedish music tends to be in major keys and Finnish music in minor keys, focusing his research on popular music in particular. During the 20th century, schlager music evolved in different directions in Finland and Sweden. Finland-Swedish people were more attuned to what was happening in Sweden, while popular music in Finnish was heavily influenced for instance by Russian romances, which were typically in a minor key. Even today, Finland-Swedish dance music tends to be in major keys, and if a Swedish-speaking dansband wants to break through the language barrier and play for Finnish-speaking audiences, they have to change their repertoire. Hit songs in English work well in both contexts, though. In the aforementioned anthology, Niklas Nyqvist, director of the Finland-Swedish Folk Music Institute, analyses a sub-genre of popular songs known as laulelma in Finnish and visa in Swedish [simple and intimate songs often associated with and performed by singer-songwriters]. There is a clear connection between this Finland-Swedish sub-genre and its parallels in the other Nordic countries, while in the Finnish-speaking majority culture this tradition is far less common. Nyqvist mention Höstvisa [Autumn song], composed by Erna Tauro to lyrics by Moomin author Tove Jansson, as an example of a song that has become popular in both Finnish and Swedish and even seen as a bridge-builder in musical terms, as its tonality varies between major and minor. A shared corpus of songs is one of the tools that has traditionally been used for building up the Finland-Swedish identity, and schools, choirs and song festivals have been important vehicles for transmitting these songs. Camilla Cederholm surveyed the Finland-Swedish song heritage in her dissertation Du sköna sång, vårt bästa arv [O lovely song, our finest inheritance] (2013). She compared lists of songs from various times and sources. (Most of those songs, too, are in major keys.) The title of her dissertation is a line from the song Modersmålets sång [Song of the mother tongue]. Written by Johan Fridolf Hagfors in 1897, it is still regarded today as an informal Finland-Swedish anthem: people often rise to their feet out of respect when singing it. An interesting part of this traditional repertoire is formed by folk tunes that were incorporated into the Finland-Swedish song heritage in the early 20th century. The practice was to take traditional tunes played by fiddlers and fit them with National Romantic lyrics and then to arrange the resulting songs for choir, ensuring their rapid dissemination. Songs such as Plocka vill jag skogsviol [I want to pick forest violets] and Över bygden [Over the region] are today often thought to be folk songs, even though their lyrics were written by known poets to existing tunes. Slumrande toner [Slumbering tones] has been elevated close to anthem status among the Finland-Swedish people – though the very same tune is also part of the folk music tradition in Finnish-speaking regions, for instance at Kaustinen, where it is known Juottomarssi [Booze-up march]. Johanna Björkholm explored the emergence of the Finland-Swedish cultural heritage from the folk music perspective in her admirable dissertation (2011). She discussed not only the people involved in collecting folk music but also their agenda. Apparently these collectors considered that the older the music, the more valuable it was. Therefore, among the tunes collected, minuets and polskas were seen as particularly worthy of interest. 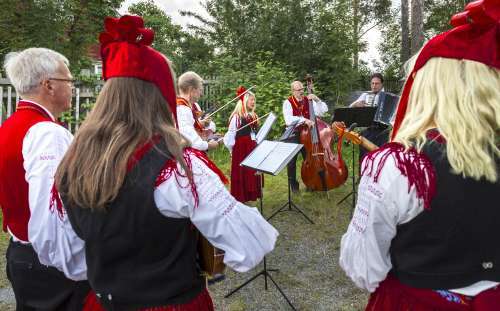 The minuet in fact survived as a ceremonial dance at traditional weddings in Swedish-speaking Ostrobothnia up until the 1950s, and this tradition continues to be actively sustained by both fiddlers and folk dancers. Today, musicians and enthusiasts all around Finland have opportunities take an interest in the Finland-Swedish fiddler music tradition through published sheet music and recordings. This tradition includes certain types of dance not so common in the Finnish-speaking tradition, such as the lilting, Romantic hambo, the polka-like snoa and, of course, the minuet. Among professional musicians, Maria Kalaniemi and Marianne Maans in particular have distinguished themselves in bringing this repertoire to a wider public through their performances and teaching. Björkholm Johanna: Immateriellt kulturarv som begrepp och process. Folkloristiska perspektiv på kulturarv i Finands svenskbygder med folkmusik som exempel. Åbo Akademis förlag 2011. Brusila Johannes, Moisala Pirkko, Väätäinen Hanna (eds. ): Modersmålets sånger. Finlands svenskheter framställda genom music. Svenska Litteratursällskapet 2015. Cederholm Camilla: ”Du sköna sång, vårt bästa arv”. Kanonisering av en sångskatt ur ett hermeneutiskt perspektiv. Åbo Akademis förlag 2013. Nikula Heikki: Häämusiikkia kielirajalla – Bröllopsmusik vid språkgränsen. Kansanmusiikki-instituutti 2013. In 2017, there were about 283,000 people in Finland whose first language was Swedish, accounting for 5.5% of the population. Most of them live on the southern and western coasts of the country and in the Åland Islands. Most Swedish speakers are bilingual in Swedish and Finnish, and bilingualism seems to be on the increase but is not recognised in national statistics.